The nights are nippy, maybe a few degrees warmer than Amsterdam, but despite the cold, it’s when the sun goes down that a different side of Paris comes alive. 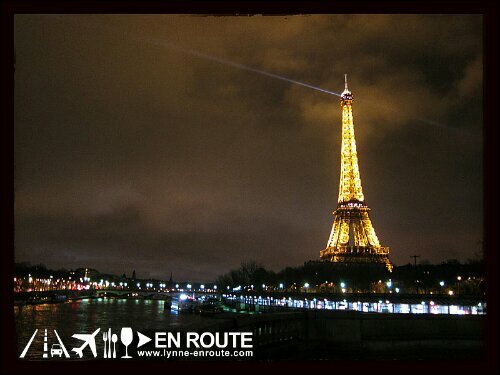 The Eiffel Tower is fully lit and it sparkles for five minutes every hour! We found a spot from across it on Pont de Bur Hakeim, right on the Seine where you get this spectacular view. We’ve only arrived so there’s much to experience. For sure, we must go to a cafe, a bistro, try freshly-baked bread from the boulangerie, and if we’re lucky, get to try a Michelin-star restaurant. I let go of my traveler hat for a bit and also don a tourist hat as I can’t leave without seeing the main tourist spots. Although, in case we miss any, it just means we have a reason to save up and go back someday. It’s been over 10 years since the last visit to Paris, and that was riddled with a then pigeon poop problem and lots of illegal peddlers by the Eiffel tower. Now, it just seems different. It’s still not yet spring as the trees still haven’t bloomed, but the air seems cleaner now. And less people, too! It could have been better, but at the same time, it can’t get any better than this. This is really exciting. This time, seeing Paris in a new light and in a way I haven’t before. More of this soon! Yup, we are! We’re trying to taste the food also in every place we visit.